TV Ghost continue their evolution on Disconnect with better production and more sophisticated arrangements. TV Ghost began with the nervy post punk energy of Wire and the maddening clangor of the Fall. Despite those reference points, TV Ghost’s debut Cold Fish was more haunting and a bit more sinister than that of their influences. On Cold Fish, each song went by in sudden bursts of energy that shot to life in absolute urgency and fizzled out just as quickly. TV Ghost changed things up on their follow up, 2011’s Mass Dream, dropping the nervous energy and allowing the songs more room to breathe and grow. In doing so, the guitars and keys had more space to develop. The songs built up and broke down, their lengths were doubled and Mass Dream was a more varied listen than their debut. On Disconnect, TV Ghost continue to flourish, this time by adding more guitar texture and shoegaze elements. Immediately, it is clear that Disconnect is the band’s best sounding record to date. Every song has the same type of dark atmosphere, but the guitar and keyboard textures are better developed and the instrumentation is more nuanced. On “Five Colors Blind”, Disconnect kicks off the album in an eerie haze, the sonic equivalent of a picture taken with Vaseline smeared on the lenses; no sharp edges. The music evokes the gothic low-end drive of Joy Division and the dark neo-psychedelia of the Black Angels and the Warlocks. “Veil” is a kaleidoscope of rhythm, with guitars and bass circling each other in a death match as the keyboard adds cloudy night textures. The music is consistently haunting, a nightmare that you can’t quite recall now that you’re awake or an uneasy walk home on a starless night. “Dread Park” is a sinister simmer of a song thanks to singer Tim Gick's devilish whisper. “A Maze of Death” is a psychedelic apocalypse dirge in the vein of the Black Angels debut album Passover. Gick’s voice rarely rises above a monotone drawl but “A Maze of Death” is his most impassioned performance on the album. It makes me wish that he would sing in this vein more often, if nothing else then to add a bit more drama to the proceedings. The shoegaze guitar textures used throughout the album are excellent and divulge a huge growth in the band’s sonic abilities from their past efforts. The main drawback with this album is that there isn’t much variation and the songs just start to all sound the same after awhile. There isn’t much to grab on to from song to song and sometimes the music doesn’t seem to go anywhere. “Placid Deep” is a good example of this, opening with a delayed guitar line reminiscent of Syd Barrett-era Pink Floyd, before moving on to a stoner rock riff that just doesn’t build to anything. The song just falls off into guitar-laced ambience and you’re left asking yourself what the point was. “Siren” closes out the album, mixing the gloom of Joy Division with the noise pop of Medicine circa The Buried Life. Disconnect is a big step forward in the development of the sound of TV Ghost, revealing an instrumental depth and musical maturity only hinted at on previous efforts. The sound of the album evokes a dreary wasteland, utilizing gothic psychedelia to find a middle ground between Joy Division, shoegaze textures, and mid-70s Pink Floyd. 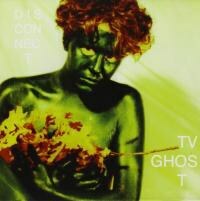 On Disconnect, TV Ghost sound better than ever but, despite the sophisticated arrangements of the songs, TV Ghost need to give us a little more in order to really stand out from the black psychedelia of similar bands.